In order to stick to a resolution, there are some strategies you can use. First, you could put your money where your mouth is (pay money to show you are serious about something), for instance by taking out a gym membership to get fit. One common piece of advice is to take it one day at a time (not focus too much on the long-term goal). After all, as they say, Rome wasn’t built in a day. 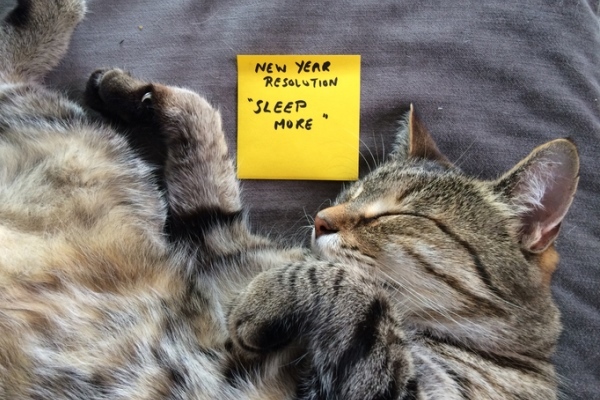 Some people are very successful in their resolutions. Once they’ve decided to bite the bullet (do something difficult), they get their act together (organize themselves effectively) and put their heart and soul into achieving what they want to achieve. If they manage to stay the course (not give up), they will see their efforts bear fruit. Great, please kindly let me know, how it gonna be happend. I would like to follow your plan if you have any specific and realistic pathway to make it .. Thank you very much Liz ! As usual, this post is very helpful. Fabulous! Thnx for your effort and detailed work! Splendid!i will not leave any leaf unturned in learning these idioms. ” the road to hell is paved with good intentions”, I am still fail to catch its meaning. It means that although we intend to do good things, we often don’t do them in reality. Hi Joyce, think of a mother has kids and she has good intentions to raise them well and keep them safe, but she also has to work hard for money to maintain this good attention. If she terribly spends more time at her work than at her home with her kids, they may lose their belonging to her and feel alone and sad, even they might be criminals, God forbid. For me, I hate this saying and I still believe in good attentions and their good influence on life and people. Sad to say but this has been me for the last 18yrs… I had to quit employment in the beginning of this year to give my children more time. I have decided to be back on the straight and narrow and work with something that leaves me a bit more time for the children. It means that there is no chance of a successful future for it. Thank you Liz, it is well built text. I read it twice and I still feel keen on reading again. You’re an absolute genius – you just have got your act together and put your heart and soul into bringing all necessary expressions and explaining them. In Russia we are celebrating Christmas tomorrow and are turning a new leaf now. (The so called “Russian old New Year celebration” is on the 13th of January, though it is a home holiday now). Thank you , Liz, for this excellent present! I wish we had more posts of yours and I hope we all will be back on the straight and narrow. Good luck and Happy New Year! Thank you, Tatiana – if you click on my name in the place with pictures of all the blog authors, you can get many more posts! Incidentally, I receive your wonderful ABOUT WORDS section and I think your articles are great!!! As a couple of people have asked about this – to see more of my blogs, or those of any of the other authors, just go to the ‘author’ section on the right-hand side of this page and click on a name to see all the older posts. it’s really helpful dear, nice work. I learnt something new from the post. And happy New Year to you dear. That’s a well-done job, I must say! I’ll definitely study the article again and go to great lengths to use the expressions in my speech. I loved all idioms. Nice work. It is also said : Paradise Road is fraught with difficulties, it’s not easy to reach without hardship and trouble . And The road to hell is fraught with lusts..
Liz, your blogs are the best( in my opinion)! Thank you very much!